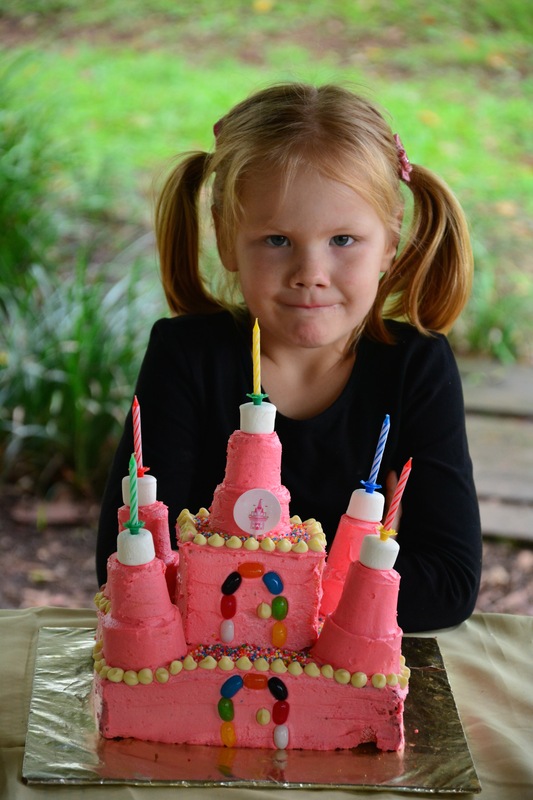 Lexi turned five on the weekend. Five already? Where has the time gone? I haven’t even finished putting her baby photo album together yet!! 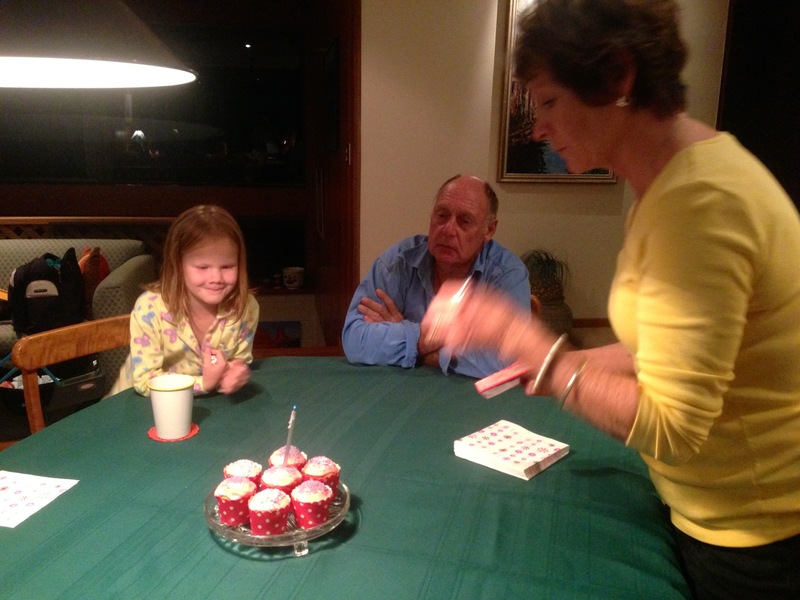 We started her birthday celebrations off a little earlier in the week with a trip to Grandma’s house at Tinaroo for a yummy lasagne dinner and the most delicious cupcakes for dessert. Then of course we had to take patty cakes in to school for afternoon tea on Friday for Lex to share with all her class mates. The kids is Lexi’s class were all so polite and not one bit of patty cake was thrown out which was lovely to see! Finally the weekend arrived and the birthday itself began with present opening in the morning. Lexi was so happy to receive the much longed for pink CD player and much to Dad’s dismay, a copy of the ‘Frozen’ soundtrack to play in it. No prizes for guessing what song has been on high rotation in our house almost constantly for the last few days ………….”Let it Go, Let it Go” …………………. gah! The things we do for our kids! 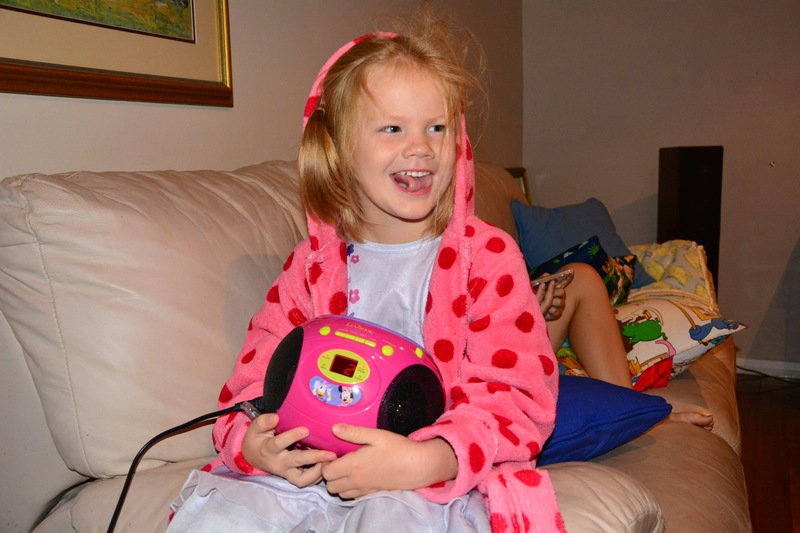 So happy with her pink CD player! 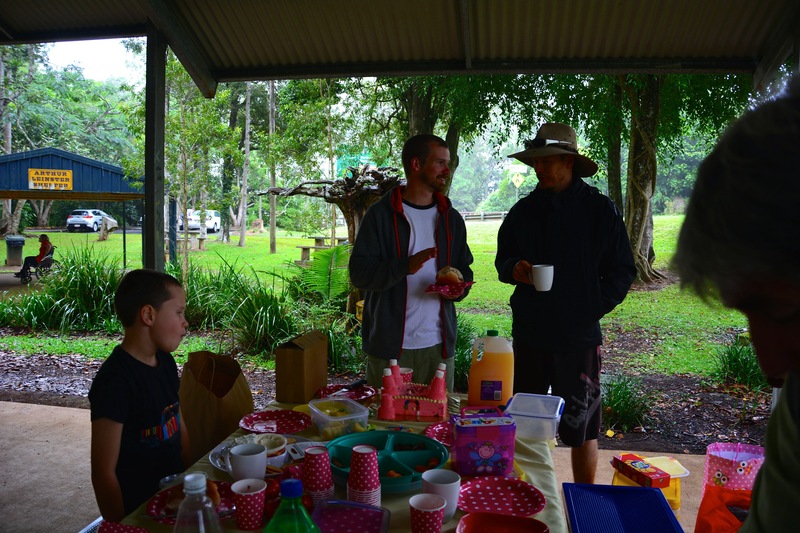 As Lex’s birthday fell on a Saturday, we decided to celebrate with a small picnic lunch in Atherton after the boys had finished their hockey games. Lex trying to be patient at hockey before her birthday picnic! 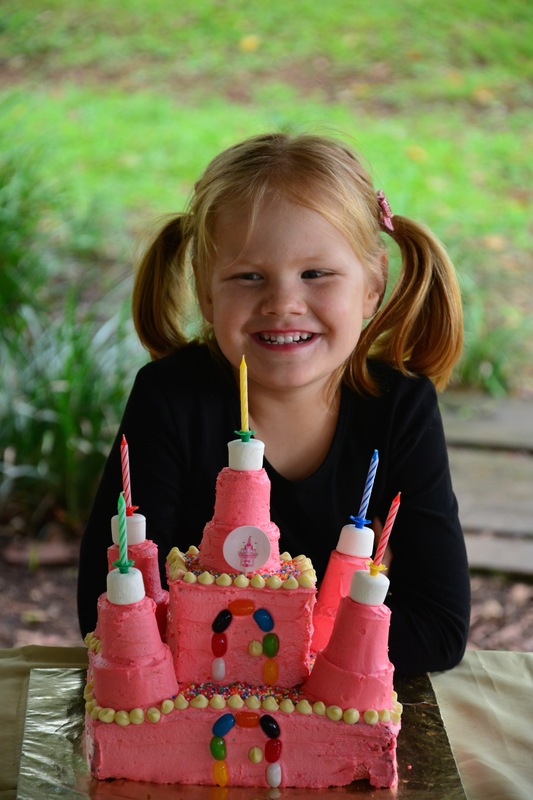 So we had a bit of a mission to pack up the requested ‘Castle’ birthday cake into the fridge in the car and cross our fingers and hope it survived to be presentable at the other end! 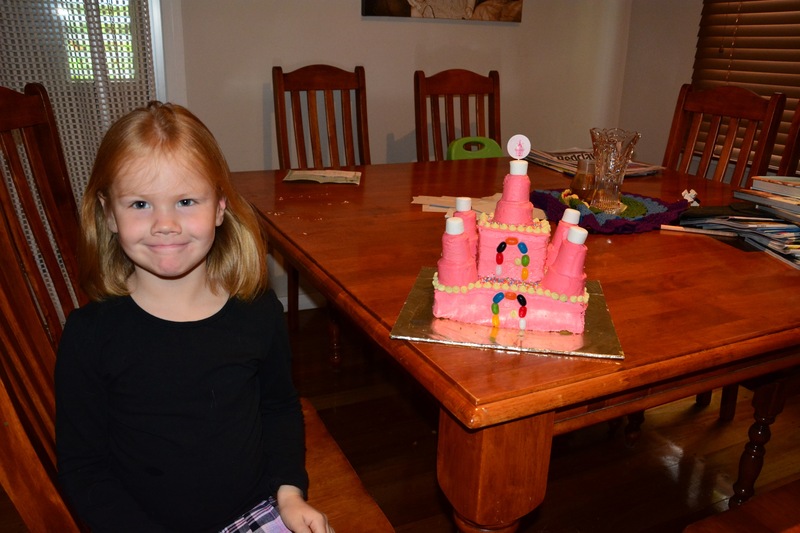 A photo of the birthday girl with her castle cake before we left home just in case it didn’t make it to the picnic in one piece! 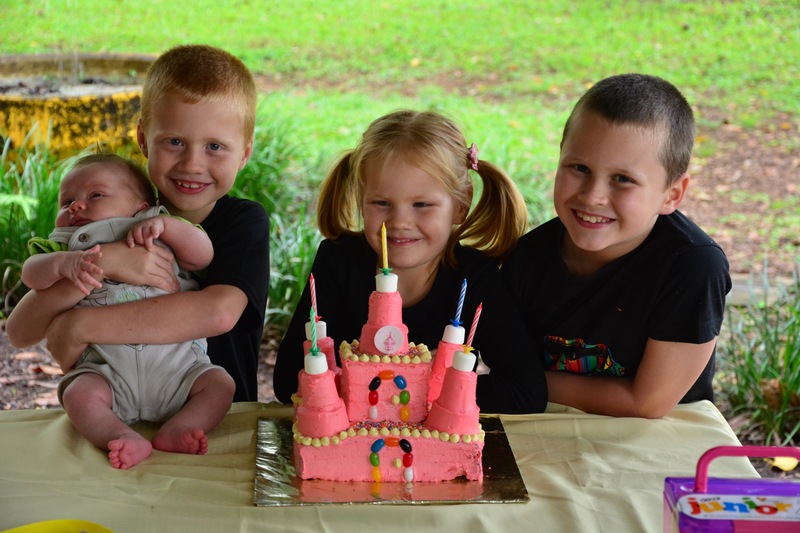 We had another birthday party of a friend of Jack’s to go to in the afternoon after Lexi’s picnic party so we had to prepare for a very long day out! 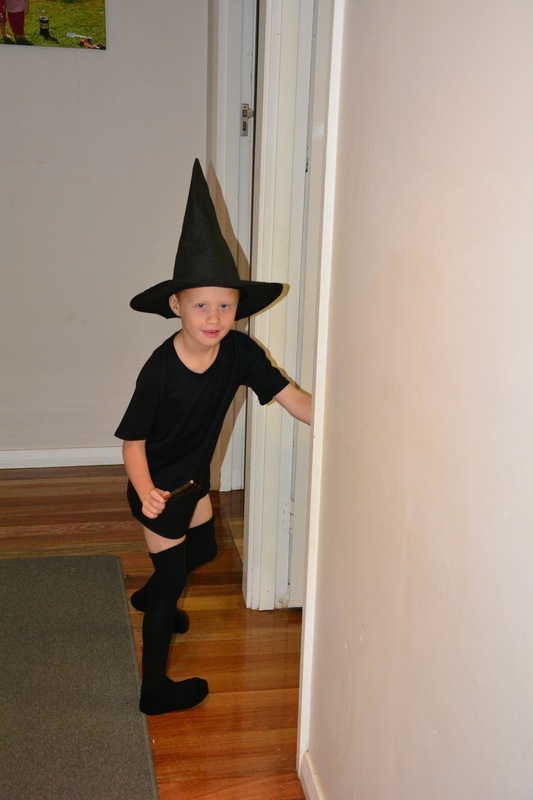 It was a Harry Potter party and the kids love dressing up – especially Toby! Tobes in his Harry Potter gear and hockey socks! 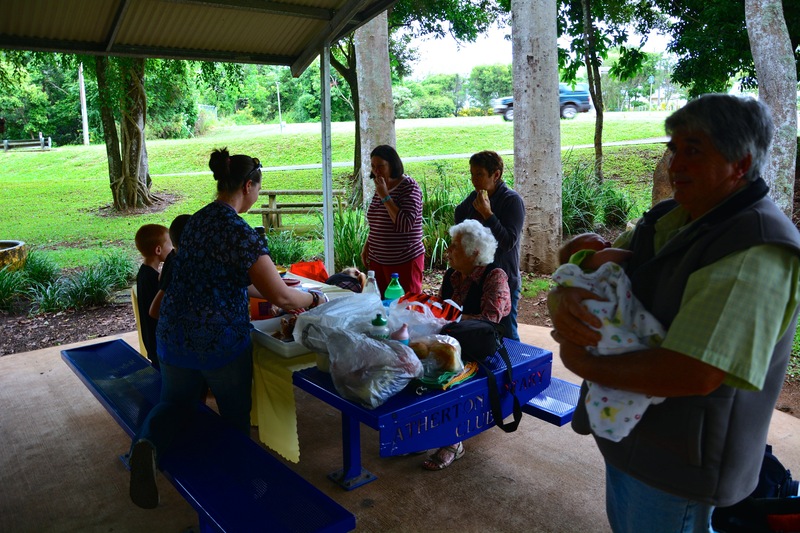 We had a really nice picnic at the park for Lex’s birthday lunch – despite the rain. 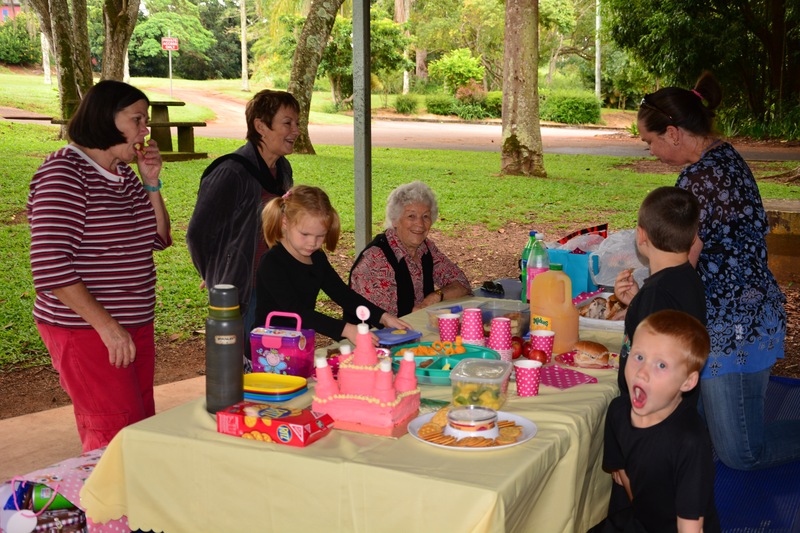 Grammy and Grunda, Aunty Meryl, Great Grandma, Uncle Jimbo and Brad all come along to wish Lex a happy birthday! 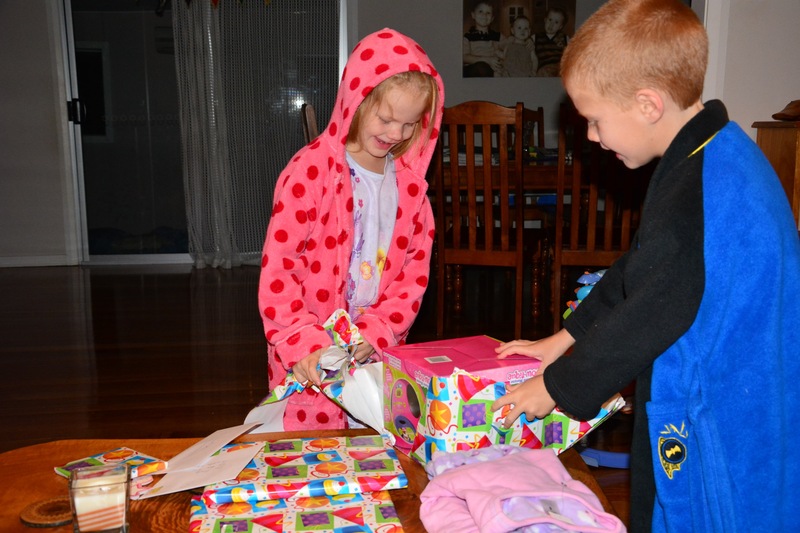 Lucky girl opening some more presents! 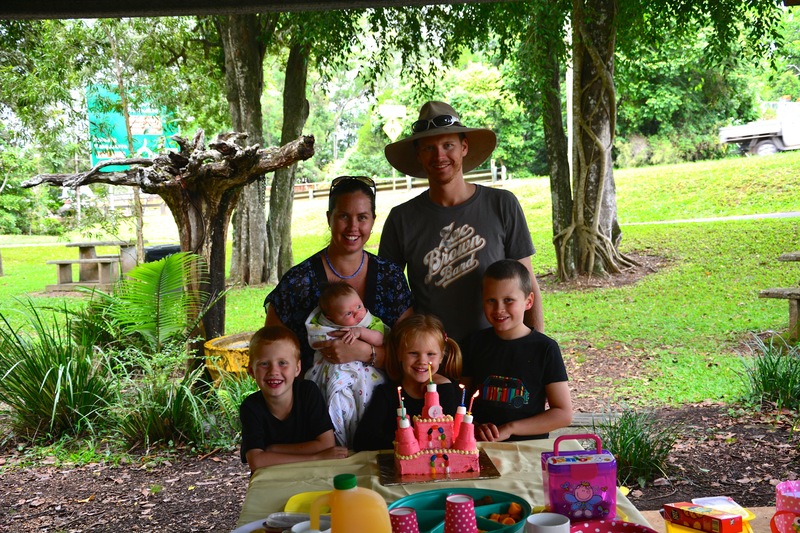 It was definitely an improvement on last year’s birthday and we all enjoyed the small party! 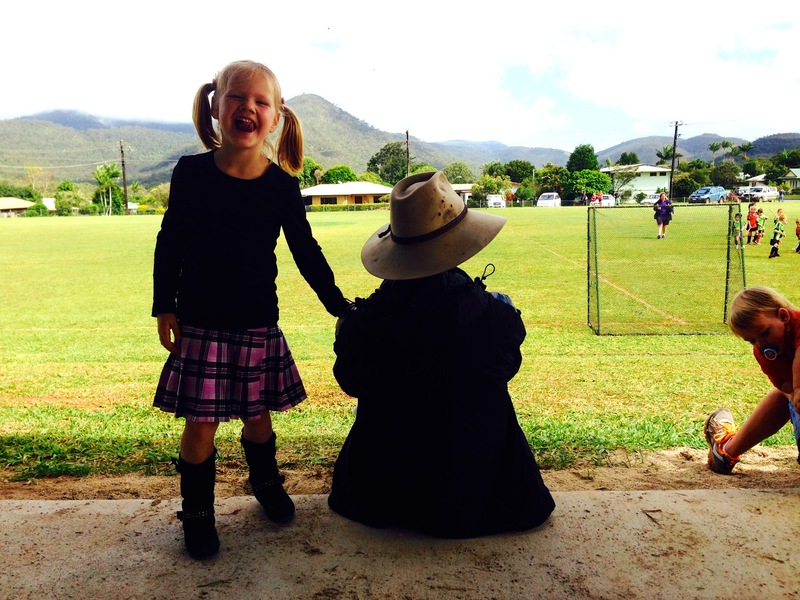 I thought I’d finish this post with just a few notes about the little person Lexi is currently, things that she might like to read back on in the years to come and that I might forget as she grows older! she loves to pack her small backpack full of toys, a water bottle and a container of biscuits raided from the pantry cupboard and head off down the driveway on her pink bike all on her own, often at 5.30am in the morning! Sometimes we will get up and find her missing from her bed and look down the driveway and see her riding along! often on her early morning bike rides Lex will pick flowers and put them in the basket on the front of her bike and bring them home for me. I will find about half a dozen cups on the kitchen bench filled with water and flowers! It makes me smile. 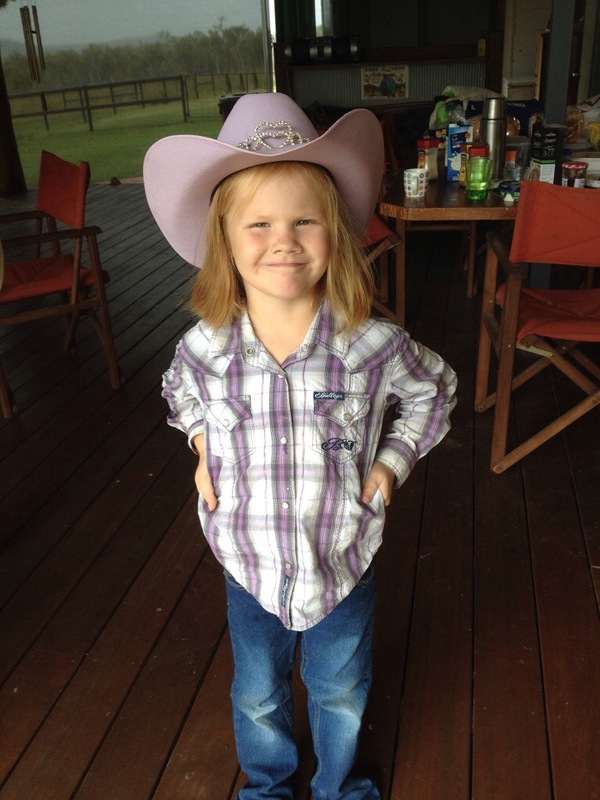 Lexi’s best friend this year is a little Aboriginal boy called Alvin. She took an easter egg to school especially for him and often asks me to pack extra biscuits and treats in her lunch box to share with Alvin. Stubborn, strong, independent, adventurous, determined and very headstrong are words we would use to describe Lex this year = hard work for mum and dad! Lex loves to dress up and often comes out in the morning in the craziest outfits! 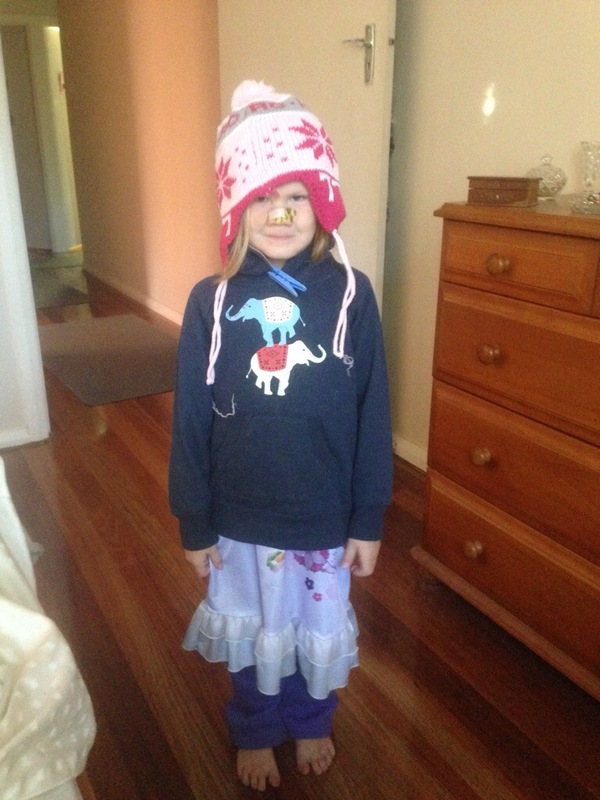 One of Lexi’s morning ‘outfits’ – this was in the middle of summer! Yes, she also has a bit of a bandaid obsession! Lexi always has the messiest bedroom! She has been having lots of nightmares over the past year – we don’t like it! Lex is loving learning to write and nearly every morning we find an envelope beside our bed with a little letter or drawing inside it. The letters are lovely, the drawing on her bed, our coffee table and the walls is not!! We love our little girl lots and lots and feel so lucky to have her in the family, a little bit of pink in amongst all the blue! Happy 5th Birthday to our little Lexi Lou! What a lovely family and beaut little girl. 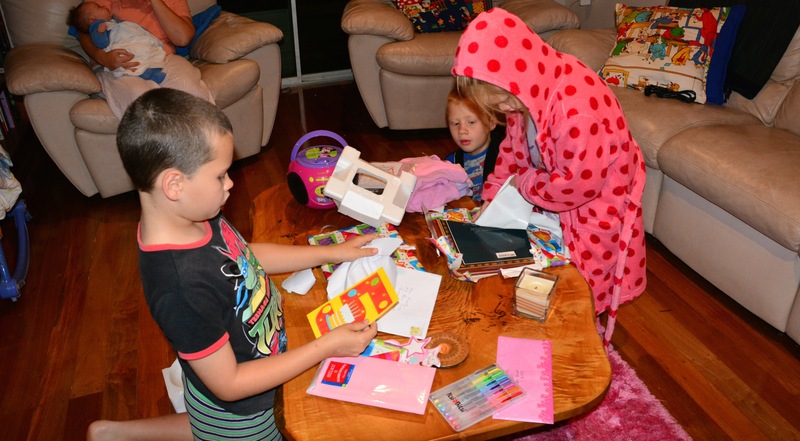 Flowers for mum – so thoughtful! That cake is AMAZING. Well done you. Do you ship to Tas-Vegas?? Those patty cakes look so yummy!